The Kings of R&B - Joe, Tank, Jagged Edge and 112 will all take to the stage in London's IndigO2 as part of their Kings of R&B tour this coming October. The legends in the game will come together for two nights in London for their own headlined show. Joe and Tank are the only two solo artists that will grace the stage on the two nights along with the groups Jagged Edge and 112. 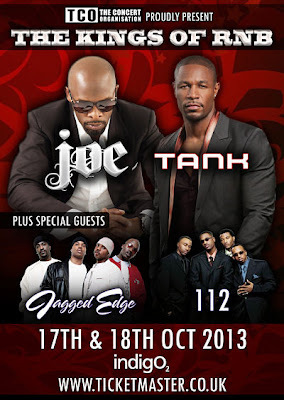 As exciting as this is for Joe, Tank and Jagged Edge fans in the UK, 112 fans are also in for the same amount of excitement as they have given fans a chance to see them perform once again - from when they joined again in 2012. Joe and Tank will NOT be performing at the Birmingham show, but Jagged Edge and 112 are sure to give a show-stopping performance. Check out the tour dates below, along with where to get the tickets from as well. Get them fast, before they run out! This is a show NOT to be missed!